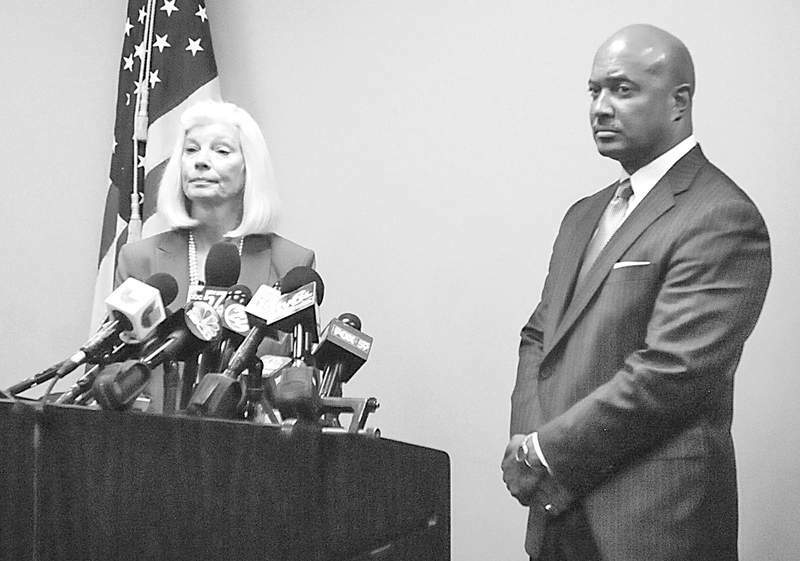 Michelle Davies | The Journal Gazette Allen County Prosecutor Karen Richards and Curtis T. Hill, Jr., Prosecuting Attorney in and for the 34th Judicial Circuit, Elkhart County, Indiana, held a press conference Tuesday afternoon. Greg Zoeller has, in many ways, done an outstanding job in his two terms as Indiana attorney general. He’s been a zealous advocate for consumer protection and open government and a leader in the battle against opioid abuse. Whether voters select Democrat Lorenzo Arredondo or Republican Curtis Hill to succeed him, though, the next attorney general needs to steer away from the kinds ideological battles Zoeller has so often leapt into. The last few years have seen the attorney general’s office become embroiled in beyond-state-border fights on such issues as gay marriage, Obamacare and environmental regulations. Both Arredondo and Hill say they would evaluate such ventures soberly. The attorney general has "a duty to defend" Indiana laws but not to "defend the indefensible," Arredondo told us. "Since the late ’90s and early 2000s, the attorney general’s office has become very politicized. ... We’ve got to get it back to doing the job it is supposed to be doing." Hill said he promises to approach such potential interventions and suits by looking at the effect on the state and asking such questions as "Does it make sense? Is it reasonable?" Both Arredondo and Hill seem to be well motivated and to have a good understanding of the basic duties of the office. Arredondo was widely honored for his service as a Lake County Circuit Court judge. Born in East Chicago of parents who had immigrated from Mexico, he was the longest-serving Hispanic state trial judge in the nation when he retired in 2011. Arredondo has since worked with a nonpartisan civic-education program he created at the courthouse named for him in East Chicago. Hill, who is in his fourth term as Elkhart County prosecutor, is also a formidable candidate. He is known as a strong law-and-order advocate. "I believe in the work of keeping people safe," he told us. Sometimes Hill’s approach is too by the book: In one celebrated case, Hill obtained felony murder convictions and long sentences for four young men after a fellow burglar was shot by a homeowner. Three of those convictions were later modified by the Indiana Supreme Court. Both men seem to have similar takes on major statewide challenges. On the drug crisis, for instance, Hill said he wants drug dealers and manufacturers in prison, but added, "we want to make sure that people who are getting caught up with addictions have appropriate opportunities for treatment." On the same issue, Arredondo said, "Some people you’ve got to lock up." But he would emphasize "treatment and education" for users and their families. In truth, either could be successful if he keeps the focus of the Indiana attorney general’s office on Indiana needs and problems. For this job, leadership skills may outweigh either judicial or prosecutorial experience. On that basis, we endorse Curtis Hill.